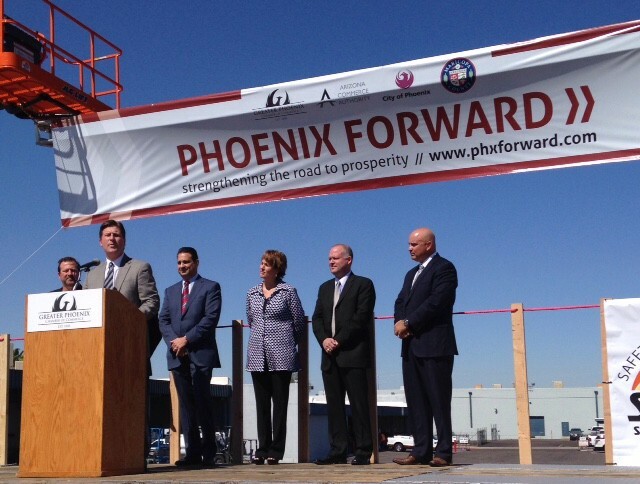 PHOENIX – Officials said local business expansion makes up 80 percent of new jobs. Phoenix leaders plan to help facilitate that growth and support business needs through the Phoenix Forward initiative, which launched Wednesday. The initiative is a partnership between the Phoenix Chamber of Commerce, the city of Phoenix, the Arizona Commerce Authority and Maricopa County. Phoenix Forward plans to meet with businesses to gain an understanding of their operation and help with retention and expansion. They will assist with developing policy issues, analyzing industry trends, overcoming regulatory barriers and promoting the region for new companies. The initiative was funded by $1.5 million from private investors and will focus on companies in four key sectors: transportation and logistics, advanced business services, health care and bioscience. 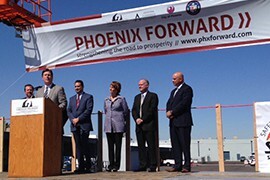 Sandra Watson, CEO of the Arizona Commerce Authority, said the Phoenix Forward initiative is about communication, collaboration and commitment to enhance the state’s economy. “The idea of Phoenix Forward is to really help support existing businesses in the state as well as in the city and to ensure that they have everything they need in order to continue to grow,“ she said. Todd Sanders, president of the Greater Phoenix Chamber of Commerce, said the idea for the initiative began two years ago in an effort to understand how to support local businesses. The first thing they learned was that it had to be a collaborative process. Russ Yelton, CEO of Pinnacle Transplant Technologies, said his company has identified new talent, explored several spaces to build a larger facility and received workforce training grants through the Phoenix Forward initiative. Stanton said the area of economic development and job growth had been too siloed. Phoenix Mayor Greg Stanton talks about Phoenix Forward, which will help with business retention and expansion.